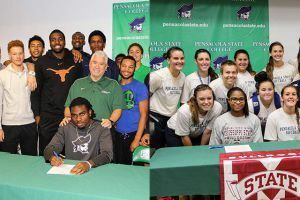 Two Pensacola State College athletes committed to Division-1 universities during a signing ceremony on Tuesday. Bevia Robinson, a PSC softball shortstop, will play at Mississippi State next fall, while Jamal Thomas, a shooting guard on the Pirates basketball team, will be at Charleston Southern University. “I’m pretty excited to be heading to a D-1 school in the SEC. It’s not too far from my home and will be a great opportunity for my parents to watch me play,” said Robinson, a Harvest, Alabama, native. At PSC, Robinson’s overall batting average this season is .597, and she has stolen 44 bases out of 46 attempts. 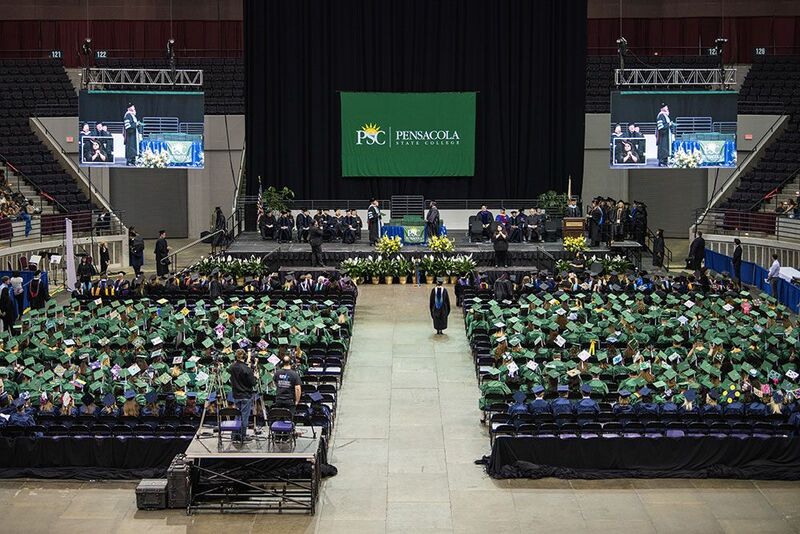 The 19-year-old will graduate next summer with an associate’s degree in general studies. Thomas, a 6-foot-4, 210-pound Toronto, Canada, native, has always dreamed of playing basketball at a D-1 school. “I can’t wait to get there, to meet the team and the coaches. I’ve wanted to play at this level for a long time,” said the 20-year-old who will graduate next summer with an associate’s degree in recreation technology. The athletes also are exceptional students. Both Thomas and Robinson are Florida College System Activities Association’s Academic All-State winners. Lyndsey Angus, PSC’s softball coach, is not at all surprised at Robinson’s successes. “She is that talented, that fast, that good of a student. She’s a good kid, hardworking, and is nice to everyone,” said Angus who added Robinson has been redshirted for the rest of this season due to a torn ACL. “The good news is that she will be able to play three seasons at Mississippi State,” the coach said. A 2014 Sparkman High graduate, Robinson has played softball much of her life and helped lead her high school team to back-to-back state championships in 2013 and 2014. She said she first learned Mississippi State was interested in her after the PSC Pirates hosted the Bulldogs in an exhibition game on Oct. 5. “Mississippi State’s softball coach, Vann Stuedeman, told me they were looking at me. My mom was at that game and the coach spoke with both of us. Afterward I called my dad. I was pretty excited about the whole thing,” she said. Pete Pena, PSC’s basketball coach, described Thomas as not only a good player but an outstanding young man. “He’s worked hard to put himself in this position to play at a D-1 school and have his education paid for,” Pena said about the 2014 Bill Crothers Secondary School graduate. Thomas who has been playing basketball since he was 6 years old thanked Pena for the opportunity to play at PSC, and move on to a Big South Conference university. “He didn’t have to give me a chance to come here but he did,” said Thomas, who added he found a family – not just a team – at PSC. Thomas said he first learned Charleston Southern in North Charleston, South Carolina, was interested in him during the summer – because of former PSC assistant basketball coach Joey Murdock. Murdock is now Charleston Southern’s assistant men’s basketball coach. Barclay Radebaugh is the university’s head basketball coach. “Coach Murdock was really impressed by my stats so the head coach (at Charleston Southern) sent another assistant down to look at me during a showcase in Tallahassee. The head coach later called me,” Thomas said.